Pooh's Hunny Hunt is an excellent trackless ride in Fantasyland and one of the best attractions at Tokyo Disneyland. 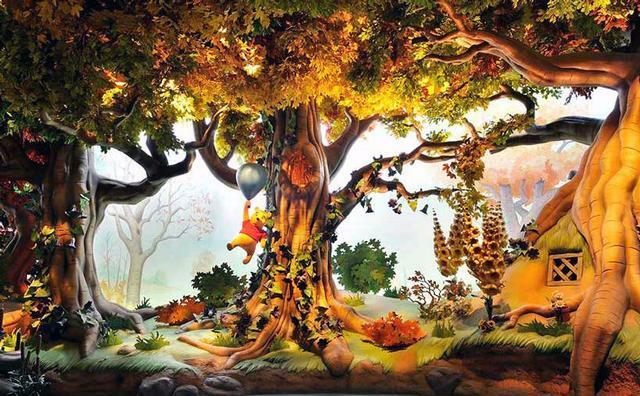 Travel through the story of Winnie the Pooh while riding in a honey pot that are guided through the ride by a unique system. Pooh's Hunny Hunt uses a computer-controlled local positioning system that guides the ride vehicles in real time, making each trip through the ride unique. Ride vehicles can react to others in the ride, creating impromptu "choreography" between ride vehicles that seem to dance together. The story's familiar to any Winnie the Pooh fan, including the Blustery Day and the Heffalumps and Woozles. The combination of a cute story and unique ride experience make this one of Tokyo Disney's most popular (and long wait-time) rides, so arrive very early or very late in the day, when the ride is the least crowded.